With 4x2 and 4x4 models – plus a choice of engines, cab and bed sizes, and trim levels – there’s a Tundra for everyone. And regardless of the options, every Tundra is standard equipped with Toyota’s legendary truck performance. The 2017 Toyota Tundra 4x2 Regular Cab SR Long Bed (starting MSRP $30,425) (5.7L V8, 8.1-foot cargo bed), which may be enhanced with the available SR5 package. The 2017 Toyota Tundra 4x4 Regular Cab SR (starting MSRP: $34,685) (5.7L V8, 8.1-foot cargo bed), which may be enhanced with the available SR5 package. The 2017 Toyota Tundra 4x4 Double Cab SR 4.6L (starting MSRP: $38,255) (4.6L V8, 6.5-foot cargo bed), which may be enhanced with the available SR5 Plus package. The 2017 Toyota Tundra 4x4 Double Cab SR5 Plus 5.7L (starting MSRP: $44,740) (5.7L V8, 6.5-foot cargo bed). This model may be enhanced with the available TRD Off-road package. The 2017 Toyota Tundra 4x4 Double Cab SR5 Plus Long Bed 5.7L (starting MSRP: $44,955) (5.7L V8, 8.1-foot cargo bed). The 2017 Toyota Tundra 4x4 Double Cab Limited 5.7L (starting MSRP: $53,410) (5.7L V8, 6.5-foot cargo bed). The 2017 Toyota Tundra 4x4 CrewMax SR5 Plus 5.7L (starting MSRP: $46,430) (5.7L V8, 5.5-foot cargo bed). This model may be enhanced with the available TRD Off-road package. The 2017 Toyota Tundra 4x4 CrewMax Limited 5.7L (starting MSRP: $55,355) (5.7L V8, 5.5-foot cargo bed). For 2017, all SR5 Plus models receive standard heated front seats, while all TRD Off-roads receive standard Navigation system, and all Limited models receive a power passenger seat. Two engine choices are offered – each delivering a commanding blend of horsepower, acceleration and efficiency: The 5.7L i-FORCE V8 is the largest displacement engine in Toyota’s history, generating up to 381 horsepower and 401 lb-ft of torque, while the 4.6L i-FORCE V8 offers greater fuel efficiency while still delivering up to 310 horsepower and 327 lb-ft of torque. 4x4 models feature on-demand, one-touch four-wheel-drive with an auto limited slip rear differential. All models feature a six-speed automatic with overdrive and sequential shift mode, while models equipped with the 5.7L engine feature a lock-up torque converter, transmission cooler, and automatic transmission fluid warmer. Tundra models with the 5.7L engine also feature a tow/haul mode that, when active, automatically changes shift patterns, boosts torque and engages engine braking to enhance control when handling heavy loads. And all 5.7L Tundra models come factory-ready to tow – being equipped with a Class IV weight distribution hitch receiver, 4 or 7 pin connector, extendable towing mirrors, trailer brake controller prewire, an extra large 144L fuel tank, and more. Towing capacity ranges from 2,945 KG (6,493 lbs) to 4,760 KG (10,500 lbs) depending on model, while payload capacity of up to 855 KG (1,895 lbs) means it’s safe to assume that if Tundra can’t move it, it’s not meant to be moved. The 2017 Tundra features commanding performance – and styling to match. 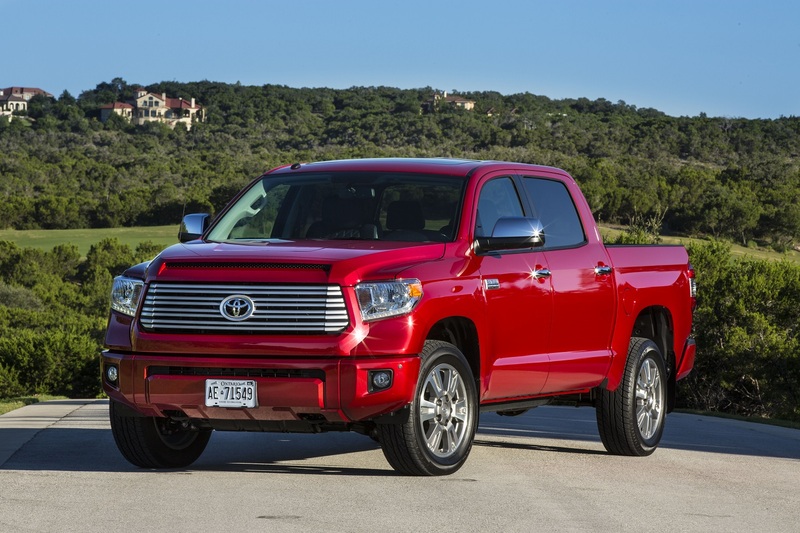 Aggressive grille designs for each trim level demand respect, while the “Tundra” name is proudly stamped in the easy lower and lift tailgate, which may also be removed or locked to secure cargo if covered with a tonneau or shell. Interiors are designed for purpose, practicality and comfort. SR and SR5 grades are work-horses, with metallic accents and bold contrasting fabric. Limited grade models offer warm and inviting premium styling, with leather seating, soft touch stitched door and console surfaces and wood grain accents. The Platinum grade brings luxury appointments to the Tundra, with perforated black diamond-stitched leather seating, door and instrument panel inserts, plus brushed aluminum accents for an upscale, urban feel. Meantime, the western-themed 1794 Edition pays tribute to the Texas ranch where the Tundra assembly plant is located, with exclusive saddle tan brown leather seats with embossed suede accents and more. Tundra delivers safety that Canadians can count on – on and off the road. Whether transporting family, crew, gear, a boat or trailer, or just a morning coffee, Tundra’s complement of active and passive safety systems has drivers covered. Large mirrors make it easy to check blind spots, while all models include a back-up camera. Airbags are tailored to the cab size, including the first driver and front passenger knee airbags in the half-ton pick-up segment. Other safety features include the Toyota Star Safety System (Vehicle Stability Control, Traction Control, Antilock Brake System, Brake Assist, Electronic Brake Force Distribution, and Smart Stop Technology) and a direct tire pressure monitoring system, plus available Blind Spot Monitor with Rear Cross Traffic Alert safety technologies on select models. The 2017 Toyota Tundra is also offered in TRD Pro Double Cab and TRD Pro CrewMax models, engineered for extreme off-road environments: See separate news release for details.